This is Dvelogre, a country known for it's high mountains and rapid temperatures. With rivers flowing through the valley floor and the cool winds blowing from the southern sea, it seems peace is all around. But people dont seem to venture too deep into the woods. Those who do feel a relief when they see the knights occasionally patrolling. For years Dvelogre has constantly been invaded by Nagonans known for their brutality on women,and children. They surround most parts of the mountains and some parts of the lowland. In times of war like this, there are these men who will fight the frontlines, protect thier king and for a cause not on thier own, for freedom. These are the Dvelogre's black knights. i've playtested the map several times. A few mines and quarries for each player. Ai's have no problem. I liked the eye candy and the terrain is wonderfully detailed. Has a "high country" feel. Again, the terrain is superb and the eyecandy in the middle is great. How'd you do the gatehouses like that? Placing most of the iron and stone on the edges of the plateaus was a good idea. Not doing so would make the map too easy. Good story, I liked it. Additional Comments: I must say, your quite a prolific author, and they're all masterfully done. Good job, keep up the good work! Took me a while to make this one..playtested about almost 20 times(sometimes other Ai's wouldn't place quarries or mines on the stones/iron provided.). Better placement was required. The drawbride placement is provided in the map design section. It's simple, First place a small/big gatehouse with a drawbridge alongside it. Then simply erase the Gatehouse with the erase tool. This map was incredibly well balanced. the same amount of stone and iron for each. i coulnd't even make more than two iron mines no matter how i tried. well the map was hard. 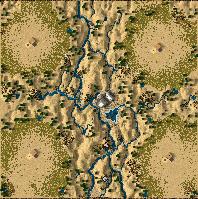 The whole idea of black knights really made me download this map. n was fantastic. Cool mountains and waterfalls and the middle design was absolutely great. Nice story short n sweet. i sometimes read stories if there're not too long n boring. The landscaping was outstanding, very detailed and well designed map, Nice job! Great playability. All players had absolutely no problems regarding their biulding. excellent map. there were some things i couldn't biuld. some biulding restrictions. fantastic designs that goes fer that incredible eyecandy too. is great. how do u mke the player black? and the aranbian blocked? nice. little stone for each. The players was given same amt of stone/iron. I fined the mountains very good. the middle design was great. How did yyou make the mountians so smooth?? this map was very good.